The world's longest inflatable water slide at Action Park in Mount Vernon, New Jersey. 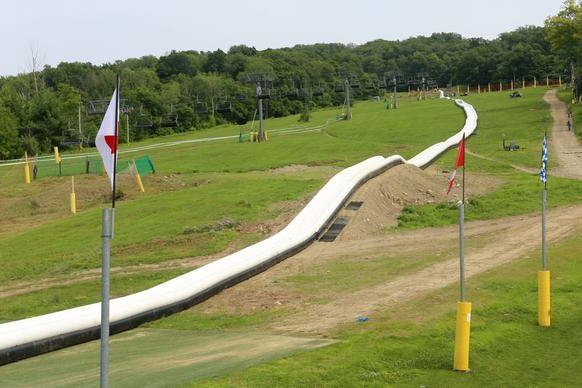 Arguably the nation's most infamous water park in New Jersey has completed work on installing the world's longest inflatable water slide. However, it may not be open to the public for months. The slide was brought to Action Park in Mount Vernon from New Zealand, according to ABC News. Nearly 2,000 feet long, it has been tested by park employees who say that trial runs have been successful. Guinness World Records verified it as the world's longest inflatable water slide on July 10, according to the Today Show, shortly after work on the slide was complete. Riders can reach speeds of up to 40 mph and the slide requires more than 1,000 gallons of water to be pumped into it every hour. The Today Show's Jenna Wolfe rode the slide Friday after it was given the world record, which you can watch below. While the public may not get to ride it this summer, as park officials told ABC that the process to get state approval could take months, it is expected to be open to everyone by 2016. Action Park was known for its extreme attractions during the 1980s and early 1990s when it was plagued with lawsuits due to injuries, and some deaths, suffered on the park's attractions. It closed in 1996 but reopened in 2014, promoting a safer environment but keeping the appeal of extreme rides. The park announced plans to reintroduce a looping water slide in 2016 earlier this year, reminiscent to a similar slide during the park's original run.